(91outcomes.com) – Today’s post is the first in a planned series about the health issues I’ve experienced since the 1991 Gulf War, treatments I’ve tried, and what has worked best for me. I’ll be discussing just respiratory and sinus symptoms in this post, with neurological and neuropsychological, immunological, eye, skin, gastrointestinal, sleep and other issues in later posts. I hope that some of this turns out to be useful to other Gulf War veterans who are also suffering. If any of this sounds helpful, of course feel free to discuss any of this with your own doctors. Please also consider sharing your own experiences as a comment below this article. Chronic cough. Most notably, I’ve had a chronic cough that began while I was still in the Gulf. Because I smelled the characteristic odors of geraniums and onions while going through an Iraqi bunker complex north of Kuwait City in the last days of the war, and the severe respiratory symptoms I developed later that night that included coughing up what appeared to be lung tissue, I believe my resultant chronic cough – which has never gone away – is the result of an exposure to a mustard-lewisite chemical warfare agent mix. I won’t go into all the details here, though if you’re really interested you can read more about why I believe this to be true, and why that I believe that only two or possibly three of us were exposed in this particular bunker complex in my July 2009 Congressional testimony. 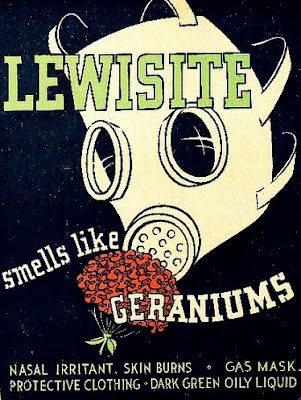 I also believe that I’m not alone, and that at least some other Gulf War veterans have respiratory issues linked to mustard or mustard-lewisite exposures during and after the war. After the initial, very bad lung symptoms, which began a number of hours after the probable exposure and worsened over the next couple to few days, I continued to cough something terrible, like the worst chest cold I could ever have imagined, coughing up stringy strands and what appeared to be small chunks of tissue. Later, I would cough up black sputum, still sometimes with what appeared to be tissue and thick, solid, but soft gunk, for the last two months I was in the Gulf region and another month after I returned home, laying on the end of my cot or bed and just coughing and coughing up the blackish gunk. Like some other Gulf War veterans, my cough has never subsided, and ranges from barking, to almost a whistling sort of sound, to productive with lots of mucous. Not asthma. Just like I have heard from many other Gulf War veterans, the VA refused to do any more expensive diagnostic testing like what was done at the private-sector hospital. VA doctors continued to hold to a mistaken diagnosis of asthma even though I continually denied having typical asthma symptoms. I now believe that the “asthma” diagnosis at VA continued simply because some doctor years ago wrongly assumed asthma was the cause, and the label stuck. Tests at the private-sector hospital, paid for by me and my own private health insurance, definitively ruled out asthma, which was no surprise to me since I have never had the typical symptoms of asthma such as the wheezing or the chest tightness I have witnessed in one of my sons who has severe asthma. 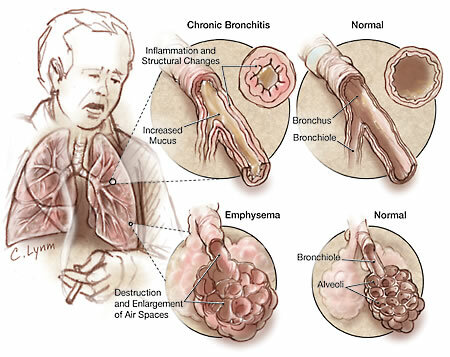 So, when I finally had a bronchoscopy and other tests last year at a private medical facility, I was diagnosed with a form of Chronic Obstructive Pulmonary Disease (COPD) called chronic bronchitis. A bronchoscopy is a fairly unpleasant and uncomfortable, invasive, but very useful diagnostic test in which a tube is inserted down into the larger airways of the upper lungs so the doctor can look at the upper airway tubes and tissues, as well as possibly taking fluid or tissue samples. 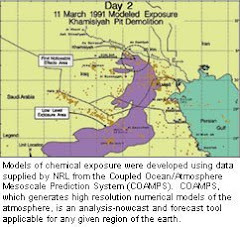 Interestingly, published scientific studies of a monitored cohort of thousands of Iranian veterans who survived mustard gas attacks during the Iran-Iraq War -- which ended just three years before “our” 1991 Persian Gulf War – show very high rates of chronic bronchitis, at well over 90 percent. Associated Symptoms. In addition to the chronic cough that brings up mucous, I also get short of breath after even mild exercise like going up a few stairs or walking from the parking lot into a store, so I’m pretty limited. In fact, as a fairly serious long distance runner, one of my earliest symptoms was how I felt during and after running. Prior to the Gulf War, running was a huge part of my life, centering and energizing me for hours or even all day after a good daily run of at least three or five miles on a few days a week to up to seven, ten, or twelve miles on as many days of the week as I had time to do so. After I returned from the Gulf, I had intense coughing spells during and immediately after running – a brand new symptoms –that were sometimes so severe I had to stop to cough, often coughing so hard I retched or vomited, then started back up and kept on running. 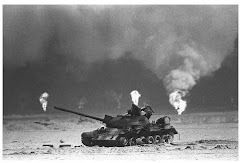 Other typical COPD/chronic bronchitis symptoms I have include severe and debilitating fatigue and weakness, though I recognize these can just as easily be caused by the neurological issues I also have, just like many other Gulf War veterans. Completely opposite from the feelings I got from running before deploying to the Gulf, including feeling energized, glowing, and just having a wonderful feeling of general well-being, after my return from the Gulf I found myself incredibly exhausted after running. That exhaustion worsened over time, and within three years of returning from the Gulf, the intense exhaustion I got would last for 24 hours or longer. I just kept trying to run harder, but would have to cut my runs short (three or four miles instead of seven or ten), and then would be so depleted when I got home I often felt an intense need to go to sleep, then would sleep for 15, 20, or even 24 hours or longer. I should add that I turned age 23 in the middle Gulf War, was only 25 when I completed my military service, and turned 26 during my first semester in college when I was learning the hard way that I could no longer go running on days when I had anything else I needed to do. What I mean by this is that I wasn’t some elderly person, I was used to being a health, extremely fit special operations warrior and very in tune with my body. Like many people with chronic bronchitis/COPD, my cough is usually worst when I first get up from bed, and in damp and humid weather. With chronic bronchitis/COPD, I also have to be very careful with acute lung infections and flare-ups, to which I seem to be quite prone, now, and they can very quickly feel like they’re getting out of control. I haven’t had to be hospitalized for the COPD/chronic bronchitis like many others have, but when things flare-up and my lungs start to feel like their filling up with mucous and fluid, it can get pretty hard to breathe right, the exhaustion is even more intense, and I just sleep and sleep. I also get fevers and night sweats on occasion, as well as facial flushing that feels hot both to me and to the touch and looks like sunburn (I’m Caucasian and very fair skinned), which are both common symptoms of chronic bronchitis (as well as a lot of other things, including adrenal gland or immune system issues). First and foremost, do not smoke! Take long, very steamy showers to cough up and out all the mucous. This is one of the most helpful things I do, and while it’s exhausting to cough so much, it feels better after everything is coughed out and feels cleared out. Take Mucinex (also available over the counter) to help dry up the mucous when the symptoms are more severe. Ensure my Gastro-Esophageal Reflux Disease (GERD) symptoms are well controlled (more on that later, too). Based on a doctor’s recommendation, I made sure when I moved that I found a home that had boiler/radiator heat and hardwood floors. I’ve learned that carpeting, forced air, and air ducts all retain and distribute dust, molds, pollens and other allergens and can make my symptoms worse very quickly. Avoid dust, smoke, and aerosol sprays. Use hypo-allergenic pillows, pillow covers, and mattress covers (VA allergists can prescribe these to be provided at no cost or for just a small copay). Use an allergy approved vacuum cleaner, including on the hardwood floors. Keep the filters in my window air-conditioning units clean. I have found that staying in some hotels with even slightly damp or musty smelling air-conditioning during the summer months can cause an overnight flare-up in my respiratory symptoms. At the first sign of a flare-up, I take large doses (1000 mg, twice a day) of Vitamin C, zinc, and echinacea. I don’t hesitate to go to my primary care doctor for antibiotics as soon as it looks like I have a full-fledged sinus infection, which usually seems to move into my lungs within just a few days at most and can get pretty bad pretty quickly. It’s very important to have a good pulmonologist, and to get regular check-ups. Now that my respiratory symptoms seem to be relatively stable, I go at least once a year, and see my primary care physician for antibiotics when necessary and other more frequent care and monitoring. I get an annual lung X-ray to ensure there’s nothing new going on. An initial MRI and CT scan were helpful in making the diagnosis, as well as lots of breathing tests. Steroids. I’ve tried inhaled steroids, which are thought to perhaps help slow the progression of COPD/chronic bronchitis. After several months of use, I didn’t feel much difference and stopped taking them. Oxygen. Though I haven’t had to go on oxygen yet, I understand that COPD/chronic bronchitis has little hope of improving and often worsens and oxygen therapy is frequently needed. To the best of my knowledge, I never had even one sinus infection before my Gulf War service, but I’ve had them chronically ever since. And, when I’ve asked service officers at some of the conferences at which I’ve spoken about any conditions they’ve seen being claimed by veterans of the 1991 Gulf War that seem different than from earlier wars, I’ve been told repeatedly about Gulf War veterans’ sinus issues. So, it seems like I’m not alone. A full blown sinus infection can be miserable, with pressure, pain, or numbness going up into your eyes, in your cheeks, down into your teeth, and of course into your nose. For me, I often also get aching back teeth on one or both sides of my mouth when I have a sinus infection. Fever, malaise, drowsiness, fatigue, blurry or double vision, watery eyes, and even nausea can be part of the package. Left untreated, the infection can spread, including into other parts of the respiratory tract. For people like me with already impeded lung function, an active sinus infection can require very careful monitoring to prevent even worse outcomes. What helps. Here’s what’s helped for me. Again, what works for me might work for you, or it might not. Sinus surgery. I’ve had two surgeries to help -- both at VA medical centers -- including one that removed the bones and mucous membranes between the sinuses to help them drain. While pretty unpleasant, the surgeries were extremely helpful, and now I’m able to get much of the infection out. Since the surgery, tipping my head upside down while standing or sitting especially helps to blow everything out. A good sinus steroid spray. I currently use Nasonex, a water-based spray which is available in the current VA formulary, though I have also used a few others with similar outcomes. VA initially prescribed an alcohol-based spray that was very painful to use on inflamed mucous membrane tissues and like something from the medieval ages. After just a few days of trying it, I protested and got something better. Knowing what I know now, I would simply refuse any alcohol-based nasal spray. You’ll need a prescription for these. Xlear. I have the good fortune of having one of the world’s leading researchers on sinus and nasal irrigation as my primary care physician, and he’s currently doing studies on this xylitol-based saline spray as a very helpful treatment for sinus infections. He says it’s used a lot in Europe already, and he’s working to help get it accepted here in the U.S. Xylitol is a sweetener and it feels like this xylitol-based spray sticks to the mucous in my sinuses and nose and loosens things up, which in turn seems to helps me to clear it out within just a few minutes of using it. Xlear is available over the counter. I’ve gotten mine in the past from Walgreen’s, though it’s available for about half the retail price from www.swansonvitamins.com. Take long, very steamy showers to loosen up and blow out all the mucous and gunk. This is one of the most helpful things I do for both my lungs and sinuses, with of course are interrelated. Many of the same things that help with my lungs help here, like the avoiding and allergy-related ones. For sinus infections that don’t clear up after a few days, or just seem to keep on getting worse, my doctor prescribes me a good antibiotic, which kills the bacterial infection. I often get Augmentin (Amoxicillin Clavulanate) for 10 or 14 days, though I’ve had better success with Ceftin, Cipro, and other antibiotics. I always make sure to take a probiotic while taking heavy-duty or longer term antibiotics to help restore the “good” bacteria in the gut, which make up by far the largest part of the body’s immune system but which are unfortunately also destroyed along with the “bad” bacteria by antibiotics. Note that sinus infections can also be viral or fungal, and treatments are different for those. Get a check-up every year or two from an Ear-Nose-Throat (ENT) specialist. While having a steel rod fiber optic scope thrust up into your sinus cavity through your nose isn’t the most pleasant of experiences, it’s good to monitor up inside to be sure of no new negative developments. While I haven’t tried this yet, I recently had a recommendation from an ENT doctor to try prednisone, an oral cortico-steroid for more quick relief, with or without antibiotics at the same time. Again, I hope that by putting this fairly personal information out there, it might help other Gulf War veterans who have similar issues. And as I mentioned earlier, while this post was only about respiratory and sinus symptoms, I’m planning on more posts that will cover neurological and neuropsychological, immunological, eye, skin, gastrointestinal, sleep and other issues in later posts. And again, feel free to discuss your own experiences by leaving a comment below. -Anthony Hardie, writing from Madison, Wis.
Anthony, I have had sinus & respiratory problems during and since the Gulf War. I noticed on a company run; most of the unit falling out of formation due to fatigue & respiratory issues. I have taken the CCEP (Comprehensive Clinical Evaluation Program) through the Department of Defense and diagnosed with sinus problems. I have since had a septoplasty; surgery to correct a deviated septum due to breathing difficulties through the nose. Later, was diagnosed with sleep apnea & due to my skin's reaction to the various masks; I am unable to wear the CPAP mask and had a UPPP (uvulopalatopharyngoplasty) recently (8/11/2010) to correct my issues with sleep apnea. I have a cyst in my sphenoid sinus cavity that is inoperable due to its' proximity to the nerves of the eye. I have constant and recurring headaches, with sinus drainage. Double and blurred vision, breathing difficulty; where I am unable to walk distances or even consider running anymore; which were a key component to my fitness regimen. These issues come and go with or without warning. Fatigue is a constant and diligent companion; with no restorative sleep. I continue to have sinus drainage & related sinus problems. These issues have affected my sleep over the years where I am unable to get a full night's rest & have tried many treatments to no avail. GERD or acid reflux is also an issue, which complicates sleep. These are some of the issues which come to mind as you have explained your conditions while in the Gulf and after. Comments are welcome, if desired for follow-up conversation. With most houses these days having some form of ventilation or heating system, it is all the more important to not overlook these things. A neglected or ill-maintained set of air ducts can easily spread dust, mold, or any air-borne infections around the house.